SNAP Gets Ready For ‘Night of Power’ Back-to-Back Shows "Gettin Kinda Hectic"
Eurodance group SNAP has their hands full as the holy month of Ramadan enters its last 10 days. The 90’s chart-topping, German team has booked non-stop shows at mosques spanning across nine states and 12 cities. The 27th night of Ramadan, known as the “Night of Power,” is better than 1,000 nights of worship. North American Muslim communities have booked the artists as a way to attract the 30- and 40-something demographic back to their congregations. Each evening around 10pm, Front Man Turbo B and American Singer Penny Ford start at their first gig of the night by performing in either a mosque prayer hall or a Muslim Community Center. They perform only one song: their 90’s hit “The Power,” to the backdrop of dancers with 6-inch block-afros, wearing MC Hammer pants – and then it’s off to the next mosque. Turbo B admits the engagements can get exhausting, as they have to do so many shows within the 10 days. According to Turbo, this is the only time of the year they can find work, and he feels it is his obligation to the community. “I’m the lyrical Jesse James,” the 48-year-old says with an assertive, wide-eyed expression as if he were staring into a camera lens. At the time, no cameras were present. Worshippers at a Sacramento area mosque say they were caught off-guard as the musicians stormed the prayer hall and started performing. Rashad Taleeb recollects how he was stunned for the first few minutes. “I’m in the middle my Sunnah prayer, and all of a sudden I hear this weird sound like someone was being electrocuted, but that was just the first eight seconds of their song,” says Taleeb, who has been coming to the California mosque for 20 years. Some in the congregation were too young to recognize the band. 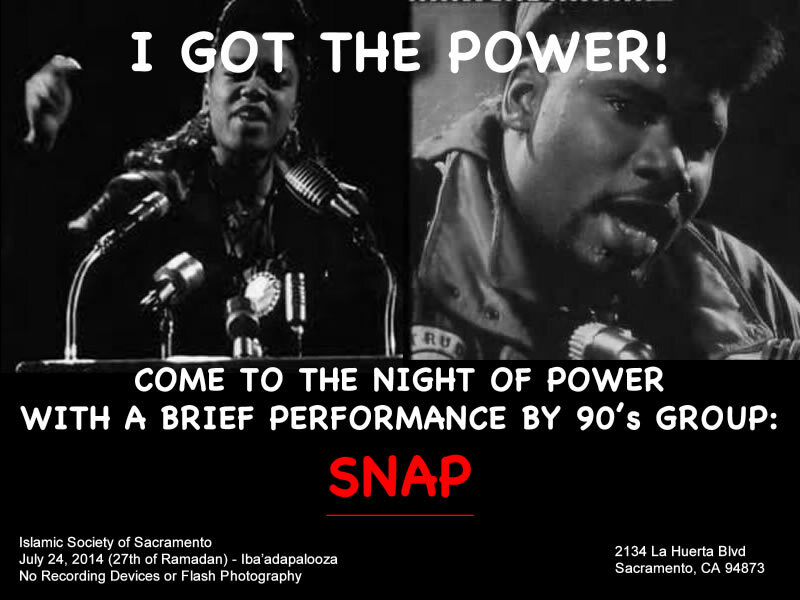 For others, SNAP’s performance triggered a moment of nostalgia and excitement. A disappointed Fatima Khan was looking forward to another song, as she pleaded with the group to stay. “What?!? No, ‘Rhythm is a Dancer’? '” said the 39-year-old mother of three. SNAP has another 20 shows through the end of Ramadan. The group says they’ll be back next year.